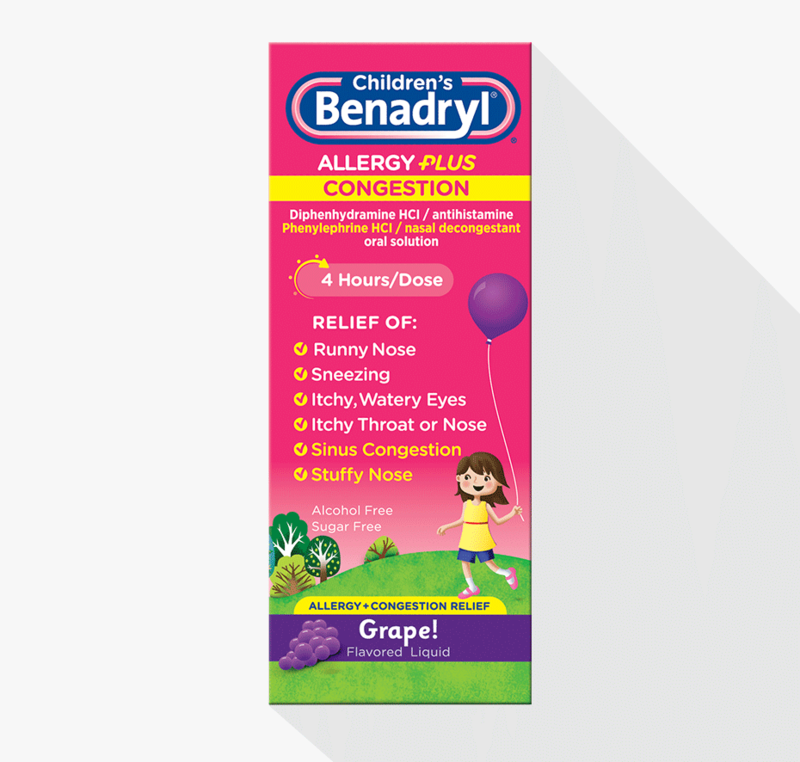 Give your children effective relief from allergies plus nasal congestion and sinus pressure with grape-flavored Children’s BENADRYL® Allergy Plus Congestion. Each 5 mL contains: sodium 10 mg.
Store between 20-25° C (68-77° F). Protect from light. Store in outer carton until contents are used. Keep out of reach of children. In case of overdose, get medical help or contact a Poison Control Center right away (1-800-222-1222). This website contains current product information and may differ from the information on the product packaging you may have. If you have any questions, please contact the Consumer Care Center (CCC) at 1-877-717-2824. Use only as directed. Do not use more than one BENADRYL® diphenhydramine product at the same time. Do any of the BENADRYL® products contain aspirin? No. 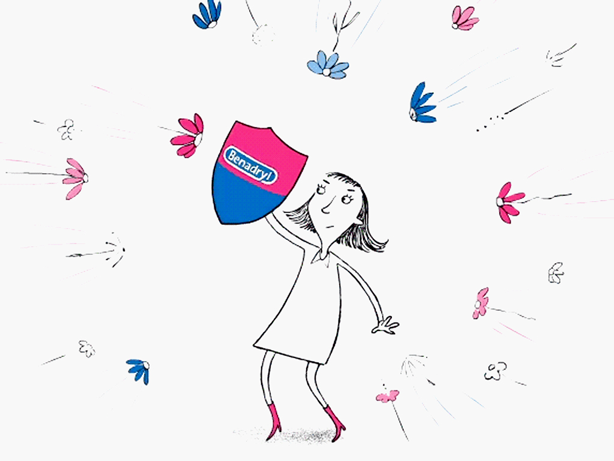 All of the BENADRYL® products are aspirin-free. What most influenced your decision to initially purchase this product? Good product, very effective, but please make it without the dye. Children don't care what color it is, they just want to feel better. It is sad to see the ingredients. You can do better. This product is the only thing that gets rid of my child’s stuffy nose and fast! 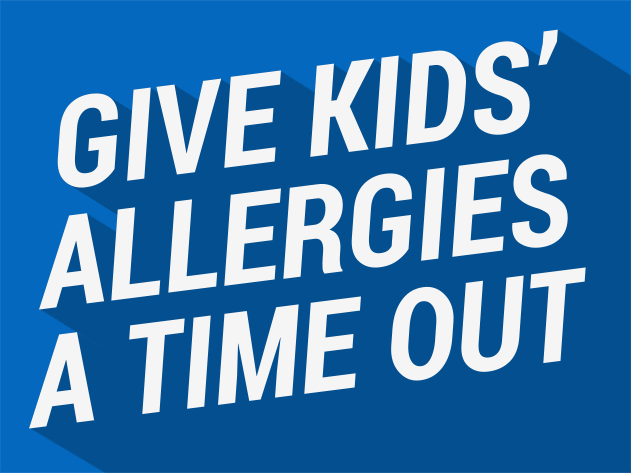 Her allergies stuff her up but nothing else for children’s allergy has a decongestant. I 100% recommend. Use for both my children. Really works for them. Tried a lot of other medicine. This works. It worked just as fast as when there.attack came on.works great easy to take. Im always skeptical when giving me kids medicine. Childrens Benadryl has been a brand I can trust. The allergy &amp; sinus relief medicine has worked wonders for my son. He gets the itchy eyes, runny nose, symptoms the worst. This product has truly helped comfort him. The price is great &amp; its found at most pharmacy's. I would suggest this to anyone looking for comfort. This product truly works, it addresses the allergy symptom that you may have in a very prompt manner. I love this product and this brand it's truly and excellent product. this medicine is so good, is easy to take and kids love the taste, it works fast and the best is that is not drowsy kids can go back to there dailys activity fast.